Paranas Mayor Eunice Babalcon (seated center) signs in the presence of Agrarian Reform Secretary John Castriciones (seated right) and Notary Public Atty. Medino Acoba (seated left) the deed of donation for the 300 square meter lot intended for the construction of the Samar DAR Provincial Office. Witnessing the event are (standing from left) Provincial Agrarian Reform Program Officer Enrique Granados III, Paranas Vice Mayor Yolanda Tan and Regional Director Sheila Enciso. 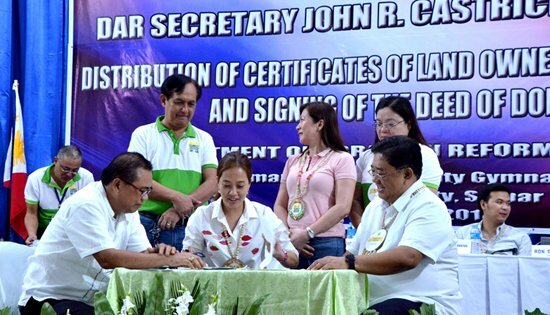 CATBALOGAN CITY, Samar – The provincial office of the Department of Agrarian Reform (DAR) currently situated in this city may soon be transferred to Paranas town after the local government unit (LGU) donated recently a lot for this purpose. Paranas Mayor Eunice Babalcon representing her municipality as the donor and Agrarian Reform Secretary John Castriciones representing the DAR as the recipient, formally signed the Deed of Donation during the latter’s recent visit to this province for the 300-square meter lot beside the Paranas evacuation center intended for the construction of DAR provincial office. The two officials signed the document in the presence of Atty. Medino Acoba, a Notary Public, and witnessed by DAR Regional Director Sheila Enciso and Vice Mayor Yolanda Tan. According to Babalcon, her municipality “is very much willing to give the property” considering the role DAR plays in improving the quality of life of the farmers. Before the formal signing of the document at the Samar State University gymnasium, Castriciones dropped by the municipality of Paranas on his way to Catbalogan City from Tacloban City where his plane landed, per invitation of the Mayor and for the symbolic tree planting at the donated lot. Provincial Agrarian Reform Program Officer II (PARPO-II) Enrique Granados III disclosed that the Samar DAR Provincial office used to occupy one of the offices at the provincial government center in this city until 2016. Since the building they were occupying was to undergo renovation, the DAR provincial office transferred to another location. From February 2016, they had been renting office space. At present, they are renting at the downtown area in this city at P140,000 a month which increases annually, Granados added. Regional Director Sheila Enciso likewise shared that though Paranas is about 30 kilometers away from Catbalogan, the government would be able to save a big amount from rentals. On the other hand, Spouses Rolando and Hideliza Tomalabcad likewise donated 7,000 square meters land intended for DAR employees home lots and dormitory. The couple though refused to issue a statement when asked for comments. Signing of both documents coincided with the Secretary’s distribution of certificates of land ownership award (CLOAs) to agrarian reform beneficiaries (ARBs). In appreciation, the Secretary presented a plaque recognizing the donors act of goodwill. 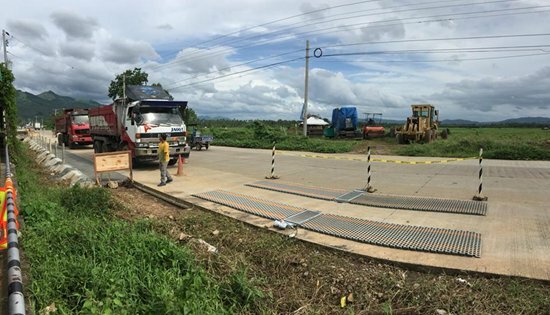 NAVAL, Biliran – The Department of Public Works and Highways (DPWH) Biliran District Engineering Office (DEO) conducts a week-long axle load survey on large trucks passing through Biliran Circumferential Road (BCR) referenced at Sitio Riverside Brgy. Caraycaray, Naval, Biliran. The operation was conducted 24/7 from September 4-12, 2018 on a rotational shifts spearheaded by Engr. Ian M. Lazarte, Regional Road Traffic Information Application (RTIA) Coordinator and Mr. Penny Lloyd E. Batoto, RTIA Coordinator of Biliran DEO. According to District Engineer David P. Adongay Jr., the main purpose of the said activity is to collect data that will be used for appropriate design standards for the said road. “It is done by weighing large trucks on a weighbridge installed on a national road” said Adongay. In accordance with Republic Act 8794, trucks are prohibited from passing through national roads and bridges if their axle load exceeds the 13,500 kilograms per axle capacity limit and allowable computed gross vehicle weight (GVW). The axle load surveys will also give information whether the roads are abused or not by the transporters, hence assist the Bureau of Design in deciding on appropriate corrective measures. The summary of the data gathered is stored in the Road and Bridge Information Application (RBIA) and is used as one of the important inputs to the new planning and programming processes. Axle load survey are part of the DPWH’s mandate in ensuring road safety. This is the first time that Biliran DEO conducted the said activity in the province. QUEZON CITY – In line with the country’s celebration of the Peace consciousness Month and in observance of the international day of peace, Sigaw ng Kabataan Coalition, an independent non-partisan national alliance of young leaders and youth organizations in the Philippines, together with the Rotary Satellite Club of Fort BGC Titans, Rotary Club of Fort Bonifacio Global City holds the Philippine Intercultural Youth Convention (PIYC) 2018, with the theme “Breaking Cultural Barriers, Empowering Young Leaders,” on September 22-23, 2018 in Great Eastern Hotel, Quezon City. TACLOBAN CITY – Eastern Visayas registered the second highest underemployment rate in the country at 27.2% in July 2018. This translates to an estimated 506 thousand underemployed persons or those employed persons aged 15 years old and over who express the desire to have additional hours of work in their present jobs; or to have additional job; or to have a new job with longer working hours. This figure is 5.3 percentage points higher compared with the 21.9% underemployment rate registered in July 2017. Bicol Region posted the highest underemployment rate in the Philippines at 28.0 percent (Table 1). Out of the estimated 3.2 million population 15 years old and over in July 2018, about 2.0 million were economically active or in the labor force. This number translates to a Labor Force Participation Rate (LFPR) of 61.8%. This figure is 1.1 percentage points higher compared with the 60.7% LFPR in the same period a year ago. Among the regions, Eastern Visayas recorded the sixth highest LFPR. The Employment Rate (ER) in Eastern Visayas in July 2018 was estimated at 95.3%, ranking sixth among the regions with high employment rates in the country. This figure is slightly lower than the 96.0% ER recorded in July 2017. Employment rate is the proportion of employed persons to total labor force. Meanwhile, about 92 thousand persons in the labor force were unemployed. This translates to an unemployment rate of 4.7%, slightly higher than the 4.0% unemployment rate recorded in the same period of 2017. Considered unemployed persons are persons in the labor force who are reported as without work; and currently available for work; and seeking work or not seeking work due to the following reasons: a) belief that no work is available, or b) awaiting results of previous job application, or c) because of temporary illness or disability, or d) weather, or e) waiting for rehire or job call. Data were based on the preliminary estimates released by the Philippine Statistics Authority from the Labor Force Survey (LFS) conducted in July 2018. MAGPET, Cotabato – A traditional military reception rites tested the 480 recruits for the Citizens Armed Force Geographical Unit (CAFGU) during the first day of their training here, today, September 20, 2018. The recruits who will undergo the 45-day CAFGU Active Auxiliary (CAA) Basic Training will be handled by the 72nd Infantry Battalion, to capacitate them with basic soldiery skills such as marksmanship and small-unit tactics. Captain Alex Raposon, Commanding Officer of Hotel Company, 72IB said that upon completion of their training, recruits will be distributed to different battalions to serve as territorial forces and defend communities which are being threatened by the Communist New People’s Army Terrorist (CNT). In the past few weeks, the recruits underwent background, security checks and screening process in selected areas in North Cotabato Province. Some of them are Indigenous Peoples who came from the towns of Arakan, Antipas, Pres. Roxas, and Magpet or the so called Arakan Valley Complex where there is strong presence of the NPA. Lt. Col. Ehrlich Noel Paraso, Commanding Officer of 19th Infantry Battalion whose unit assumed internal peace and security responsibility of the Arakan Valley Complex welcomed this recent development. 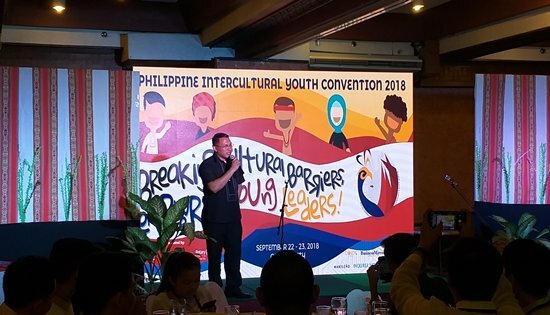 Paraso said that the territorial forces play significant role in preventing the NPAs from threatening Indigenous People’s communities, recruitment of minors and extortion efforts. Paraso hopes that there will be more people who will volunteer in the next batches of the training. TACLOBAN CITY – The Inflation Rate (IR) of Eastern Visayas increased to 6.1% in August 2018. This IR is 0.2 percentage point higher compared with the 5.9% IR a month ago, but 3.1 percentage points higher than the recorded 3.0 percent IR in the same period last year. All provinces in the region registered higher inflation rates in August 2018 compared with their figures in the previous month, except Samar, which posted a decrease of 0.2 percentage point in August 2018 (7.4%) from 7.6 percent in July 2018. Eastern Samar, meanwhile, recorded the highest IR at 8.8% during the reference month. It has also registered the highest increase in IR of 1.0 percentage point. Southern Leyte posted the lowest IR at 1.8% (Table 1). Majority of the commodity groups in the region exhibited higher IR from July 2018 to August 2018. Recreation and culture recorded the highest increase of 3.3 percentage points. It was posted at 3.9% in August 2018 from 0.6% in July 2018. This can be attributed to the huge increase in the index of recreational and cultural services. The heavily-weighted food and non-alcoholic beverages went up to 8.6% in August 2018 from 8.2% in July 2018, an increase of 0.4 percentage point. This can be traced to higher IR among all food items, except meat and food products not elsewhere classified, which posted slower IR. Fish remained to have a double digit IR at 19.6%, the highest among all food items (Table 2). Inflation rate for housing, water, electricity, gas and other fuels slowed down to 5.3% in August 2018 from 5.9% in July 2018, a decrease by 0.6 percentage point. Similarly, IR for alcoholic beverages and tobacco also went down by 0.4 percentage points but still recorded double digit IR at 21.2%, the highest among all commodities. Transport likewise registered a decrease by 0.4 percentage point, settling at 6.8% during the month in review. Education, meanwhile, retained its negative IR at 16.2%. The Purchasing Power of Peso (PPP) of the region remained at P0.81 in August 2018. This PPP implies that goods and services worth 100 pesos in August 2018 only costs 81 pesos in 2012. All provinces sustained their PPP from last month, except Northern Samar, which registered a 0.02 centavo decrease in the PPP compared with its P0.77 PPP in July 2018. Leyte recorded the strongest PPP at P0.84, while Northern Samar posted the weakest at P0.75 (Table 1). MAGPET, Cotabato Province – A female member of Communist Party of the Philippines –New People’s Army terrorist (CNT) escaped from her sexually abusive leader and surrendered to Alpha Company, 19th Infantry COMMANDO Battalion (19IB) at Magpet, Cotabato Province, yesterday; September 17, 2018. CALBAYOG CITY – Tons of trash get dumped on our coastlines every year. The garbage includes plastic bottles, plastic bags and packaging, food wrappers and cigarette butts – detracting from the natural beauty of the shore and harming wildlife. International Coastal Clean-up is part of an international campaign focused on keeping trash out of oceans, bays, rivers and lakes. 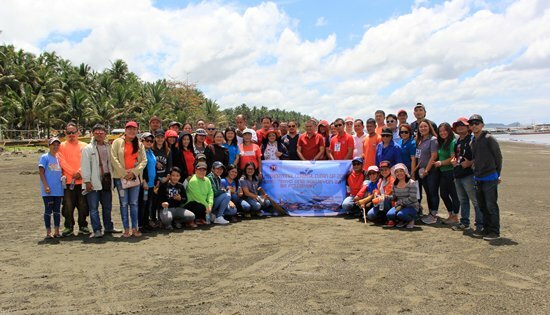 In line with this, the Department of Public Works and Highways- Samar First District Engineering Office (SFDEO) joins the 32nd International Coastal Clean-up (ICC) day on September 18, 2018 at Brgy. Burabod Sta. Margarita, Samar, with the theme “Tayo ang Solusyon sa Polusyon”, to promote better ocean health and environmental consciousness. This is pursuant to Presidential Proclamation No. 470, series of 2003, declaring every third Saturday of September of every year as the International Coastal Clean-up Day. Volunteers from every section pick and segregate trash and debris for item classification. They were able to collect 238 kilos of trash mostly consisting of plastic bottles and wrappers, used diapers, and soiled cardboard. Trash accumulates in the ocean, threatens the health of every creatures in it and the ecosystem, at the same time endangering the life of people. What goes to the ocean goes back to us. 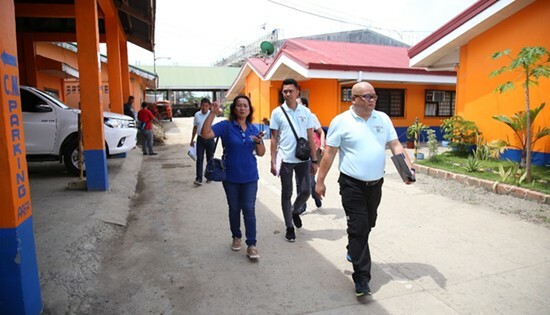 The Eco-Friendly Regional Assessors Team inspect the office grounds of DPWH Samar I last September 12, 2018. CALBAYOG CITY – With the recent global environmental issues and concerns such as global warming and climate change, various forms of environmental deterioration have reached a stage that require massive, orchestrated national effort. In line with this, the Department of Public Works and Highways launches the 2018 Recognition Awards for the Most Eco-friendly District Engineering Office. As part of this competition, DPWH -Samar First District Engineering Office (SFDEO) undergoes an assessment by the Eco-Friendly Regional Assessors Team (EFROAT) composed of representatives from the DPWH Central Office, led by Mr. Andro Santiago. The assessment aims to review the Office’s implementation of its Environmental Management Programs in terms of the following criteria: 1) Electricity Consumption; 2) Water Conservation; 3) Waste Management; 4) Greening Program; 5) Green Procurement Program; 6) Emergency Preparedness; 7) Air Pollution Prevention; and 8) Order and Cleanliness. Under SFDEO’s environmental management program, the wise utilization of office supplies and materials are religiously followed in order to avoid waste; construction materials such as asphalt containers are repurposed into plant holders; a compost pit is set up in order to contain biodegradable waste; a rainwater collection system is installed; fuel allocations are reduced; air-condition units are turned on within a specific time period; and the concept of carpooling is practice whenever there is field work. All employees are also made aware in this campaign as their efforts and actions are critical towards achieving an eco-friendly office. Based on the findings of the assessment conducted by the EFROAT, SFDEO is an above average, eco-friendly government office. “After this assessment our environmental management program will not stop, we will continue to sustain and improve our current practices in order to gain more grounds in becoming a more eco-friendly office, not only for the recognition but more importantly to help in creating a better world for the next generation,” said District Engineer Alvin Ignacio as he addressed all the employees of DPWH -Samar I during the exit conference with the EFDOAT. TACLOBAN CITY – The Philippine Statistics Authority (PSA) has started the conduct of the 2018 Occupational Wage Survey (OWS) and 2017/2018 Integrated Survey on Labor and Employment (ISLE) today, 17 September 2018, simultaneously nationwide. The 2018 OWS is an establishment-based survey that aims to monitor the wage rates of 22 low-paid occupations in 21 non-agricultural industries. Its objective is to generate wage estimates to aid minimum wage determination. The 2017/2018 ISLE, formerly BLES Integrated Survey (BITS), is a survey of establishments employing at least 20 workers which consists three modules covering topics on employment, conditions of work and industrial relations. It aims to provide inputs to studies on industry trends and practices, and bases for the formulation of labor policies. A total of 185 establishments with employment size of at least 20 workers were selected as samples across the region. These establishments were extracted from the 2017 List of Establishments (2017 LE). Questionnaires will be delivered by hired Statistical Researchers to sample establishments. However, for Biliran and Eastern Samar, questionnaires will be delivered directly from PSA Central Office through mail since their sample size is less than ten (10) establishments. Accomplished questionnaires will be collected/submitted starting 1 October 2018. The consolidated results of these surveys are expected to be released by November 2019. The PSA appeals to the public, especially the business sector, to cooperate and support the conduct of this survey. The office also assures that all information gathered will be held strictly confidential and shall not be used as evidence in court for purposes of taxation, regulation or investigation as provided for in RA 10625. TACLOBAN CITY – The region’s total number of constructions in the second quarter of 2018 reached 1,244. This reflected an increase of 4.8% from the 1,187 constructions recorded in the same quarter of 2017. By type of construction, the number of residential building constructions decreased to 843 constructions in the second quarter of 2018 from 894 constructions in the second quarter of 2017, a decline by 5.7%. The number of non-residential building constructions went up by 14.5% reaching to 205 constructions in the second quarter of 2018 from 179 constructions in the same period of 2017. The combined number for additions/alterations and repairs of existing structures significantly increased to 196 constructions during the quarter in review from 114 constructions in the second quarter of 2017, a surge by 71.9%. Majority (67.8%) of the constructions were residential buildings. Non-residential buildings comprised 16.5%, while additions/alterations and repairs accounted for 15.8% of the region’s total constructions. The total value of constructions in the region during the second quarter of 2018 was estimated at P2.4 billion. This figure is 10.8% higher compared with the P2.2 billion total value of constructions in the same quarter of 2017. By type of construction, the total value of additions/alterations and repairs more than doubled, posting an increase of 112.5%, from P87.2 million in the second quarter of 2017 to P185.2 million during the quarter in review. Similarly, aggregate value of residential building constructions increased by 24.4%, from P911.5 million in the same period of 2017 to P1.1 billion in the second quarter of 2018. On the other hand, total value of Non-Residential Buildings declined by 7.1% to P1.1 billion in the second quarter of 2018 from P1.2 billion in the second quarter of 2017. Total value of Residential Building in the region comprised the largest share in terms of value at 46.9%. Value of constructions of Non-Residential Building contributed 45.5%, while Additions/Alterations and Repairs accounted for 7.7% of the region’s total value of construction. Average cost per square meter was estimated at P8,198 for Residential Building and P8,926 for Non-Residential Building. Data were based on the preliminary results of construction statistics from approved building permits.